Hours: The Birmingham Gardens is open from sunrise to sunset all year long. 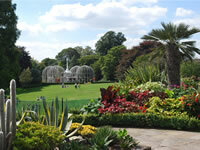 Parking and Admission to the Gardens are free! The Garden Center, parking lot, and library are all barrier free for disabled visitors. 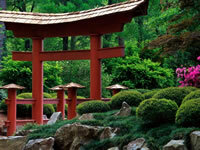 Rhododendron Species Garden: This hidden garden is a gem that is frequently overlooked by most visitors to the gardens. Those that have discovered its hidden beauty often find themselves stopping by to read a book in quiet seclusion in the rustic swing, or gazebo. All America Selections Garden: The AAS does annual evaluation trials for vegetables, annuals, and groundcover plants, and select the ones determined to be superior. Since 1933 the AAS has selected well over 650 plants considered winner, as well as adding new plants each year. 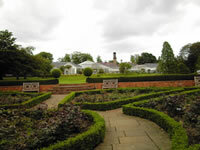 In this garden in the Birmingham Gardens, visitors can see past winners side by side with present ones, and decide for themselves which ones they like best. They can also study their life cycle throughout the season, and witness how they interact with other plants. 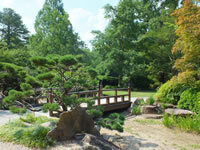 Asian Glade: This garden was designed by garden staff and funded by numerous friends of the Gardens. A light shaded site was chosen and laid out with paths bedded with wood chips, and planted with a variety of Asian native plants. Crape Myrtle Garden: This shade garden exemplifies the importance that crape myrtle trees can have when designed in properly to a garden design. A local favorite in Alabama, Birmingham has chosen crape myrtle as its official tree and the summer blooms have long been anticipated and loved in this region. Curry Rhododendron Garden: Built in 1972 and later expanded in 1975, this collection boasts over two thousand specimens of azaleas, rhododendrons, and other plants. Landscaped in a natural hollow, this garden is complete with a pond and waterfall. Dunn Formal Rose Garden: The formal rose garden of the Birmingham Gardens was first designed back in 1963 and later redesigned in 1988. The garden has become a popular favorite among staff and visitors alike, and the symmetrical design displays the collection in a way unlike anything else in the Birmingham Botanical Gardens. Fern Glade: On a shaded hillside within the Birmingham Botanical Gardens visitors will find hardy ferns from all around the world forming one of the most interesting collections with the Birmingham Gardens. Species of ferns found here come from virtually every continent around the globe, including North America, Africa, Europe, Asia, and South America. Hess Camellia Garden: The state flower of Alabama is the Japanese Camellia, which starts off the blooming season with sensational variations of red, white, and pink blossoms. This garden contains camellias that date back 50yrs and the intimate setting of this garden makes it a popular site for weedings. Hosta Walk: The hosta collection at the Birmingham Botanical Gardens contains over 100 varieties of these shade loving plants. Visitors can stroll along a stone path and enjoy a serene view of the subtle textures and colors these plants offer. Hulsey Woods: This quiet wooded area starts off with vast groups of native pines, hickory, and oak, and newer plantings of Asian native trees have been interspersed with the existing woodland. Since the middle of the 1980’s the BBG has been working to expand the woods with unusual and rare shrubs and trees from southeastern regions of Asia. Ireland Iris Garden: Two gazebos, stout stone walls, and southern native magnolias frame this garden’s four terraces that display a rich variety of irises. While Irises bloom at the start of summer in May and June, these perennials are mixed with complementary shrubs, annuals, grasses, and other ornamental perennials that give this garden year round interest. Ireland Old Fashioned Rose Garden: All of the roses in this rose garden were cultivated before 1867 and are considered old fashioned. There are over 50 varieties of roses displayed in this collection, including: China roses, gallicas, damasks, moss roses, rugosas, and bourbons. Jemison Lily Garden: This garden was given to the Birmingham Botanical Garden in 1986 and showcases a wide variety of lilies from both dense shade plants, to full sun, and everything in between. Daylilies are the heart of the collection and create a myriad of beautiful colors and textures that are sure to delight the senses. Barber Alabama Woodlands: These woodlands encompass six acres of the Birmingham Botanical Gardens and represent the oldest trees that are native to this region. Visitors to the woodlands are treated to three different areas, each landscaped with collections of plants suited to that habitat. Kaul Wildflower Garden: This rock garden first started in 1966 and continues to evolve to this day. A vast variety of over 400 wildflowers, perennials, vines, shrubs and trees present visitors with an ever changing botanical display of color and texture. The blooms of the spring and summer season give way to the autumn hues as the garden goes through its yearly life cycle. Blount Plaza: The plaza serves as the entrance to the Birmingham Gardens. One of the biggest highlights of the plaza is the Moon Tree. The Moon Tree is a gigantic sycamore that once spent time in Apollo 14, while orbiting the moon as a seedling. It has since been planted in the BBG and has grown there ever since. Bruno Vegetable Garden: The vegetable garden at the Birmingham Gardens serves as a learning center for home gardeners, as well as school children from the region. Here gardeners and students can learn the art of growing their own food, as well as learning the importance of plants and vegetables in our daily lives.